Sunheat heaters use infrared waves to deliver effective heat at low temperatures, 200 F or less. This level of heat is below combustible levels even for the most delicate materials. The all wood cabinet stays cool to the touch, no matter how long it runs. It is safe around children and pets -- in fact, pets love to lie near and even on top of the unit. Decorations and floral arrangements may be placed on top of the unit with safety. Sunheat infrared heaters cannot start a fire. The Original SUNHEAT is designed to be left on even when you are away from home. The lifetime washable filter is not a purification system but it does collect particles floating in the air, removing some allergens and dust. 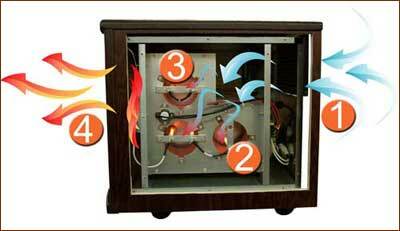 Many fireplaces, stoves and space heaters produce a dry heat that breaks up the water molecules in the air. This type of heating dries out your sinuses, throat and skin. Your home becomes static filled, uncomfortable and unhealthy. SUNHEAT filters the air and warms your home without drying out the air, so you get a warm, healthy, comfortable home environment. A combination of industrial grade infrared heat tubes and cured copper form the basis for this amazing zone heater. The infrared heat tubes transfer heat to cured copper cylinders. A whisper quiet fan pulls air from the room, through a lifetime washable filter, and into the heat chamber. The moisture in the air absorbs the infrared heat as it passes around and over the copper. Warm moist air is then pushed out into the room, where it warms you and the objects in the room. This transitive heating process is similar to how humidity and sunlight combine to create a heat index in the summertime.